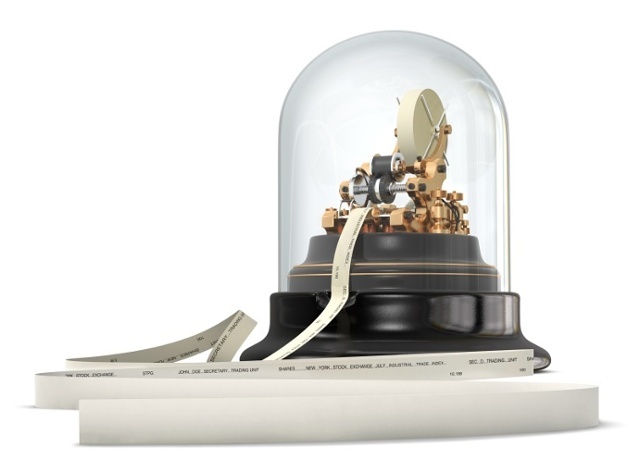 Known as the primary source of stock information for nearly 100 years, the ticker tape was the earliest electronic device to transmit stock price information over telegraph lines. In use from around 1870 through 1970, the ticker printed abbreviated company names as alphabetic symbols followed by numeric stock transaction price and volume information. The term “ticker” came from the sound made by the machine as it printed. Ticker tape machines started to become obsolete in the 1960s, as television and computers were increasingly used to transmit financial information. The ticker tape was invented in 1867 by Edward A. Calahan, an employee of the American Telegraph Company, which was followed by numerous machines all performing the same basic function. Thomas Edison himself invented and patented a ticker tape machine, which he initially sold for $40,000 when he was 22 years old. He used the money, which would be closer to $1,000,000 in today’s dollars, to start a research facility at Menlo Park, and his career as a professional inventor was launched.